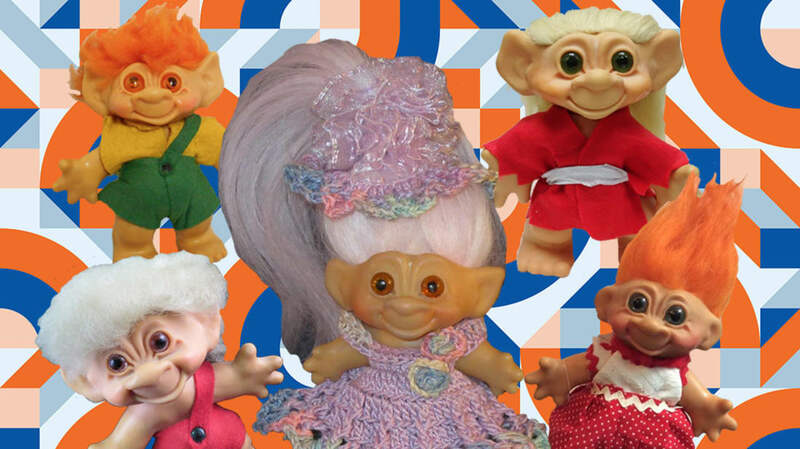 Troll dolls—like witches or choker necklaces—seem to make a comeback every decade or two. And while children of the '90s might remember collecting the wild-haired, naked dolls with gemstones for bellybuttons or topping their pencils with the miniature figures, children of the '60s were collecting their own versions. And now, with the new Trolls movie hitting theaters this weekend (and that Justin Timberlake song still rattling around in your head), it’s time for everyone’s favorite potbellied, grinning fuzz-tops to rule the toy aisle once again. 1. THE FIRST TROLL DOLLS WERE WOODEN. Danish fisherman Thomas Dam was very often out of work, but he had a talent for carving figures out of wood. Though he initially carved little gifts for his children, his wife recognized the monetary potential in his hobby. She encouraged him to sell some door-to-door, which turned into a job making larger Christmas displays for a department store window in 1956. Customers began asking to buy the trolls from the displays, and before long, Dam was spending all of his time carving troll dolls to sell. Soon after, he opened a factory and switched to the more economical method of making the bodies out of rubber stuffed with wood shavings. By the end of the ‘50s, he was selling more than 10,000 trolls in Denmark each year. 2. DAM'S TROLLS WERE ROOTED IN SCANDINAVIAN FOLKLORE. While trolls range from large to child-sized in various fairytales, their primary characteristic has always been their extreme ugliness. In their mythology, they often live under bridges or in the mountains, they spend their time tricking humans out of their money, and they’re always hideous. But Dam managed to take the usually ugly features—wrinkly faces, bulbous noses, oversized ears—and turn them into tiny, oddly adorable figurines. And since, according to Scandinavian tradition, nothing bad can happen to a person who is laughing, Dam thought of his charmingly unattractive little trolls—which he named Good Luck Trolls—as chuckle-inducing talismans. "They were so ugly," Dam once said, "that you couldn’t help but laugh, and when you laugh, luck follows you." 3. THEIR HAIR HAS ALWAYS BEEN UNRULY. Even Dam’s first trolls had the wild, crazy hair that has become their trademark. The Icelandic sheep’s wool used was dyed three colors—white, black, or orange—and glued on the tops of the dolls for a bushy, exaggerated mane that Life magazine called "strangely soothing to the touch." And though the company eventually switched to synthetic hair that stood even more upright, Dam said production demand for the dolls was so high in 1964 that he had to buy Iceland’s entire wool harvest that year. 4. DAM HAD A GREAT SENSE OF HUMOR. Dam seemed to know he had a damn funny name (it’s pronounced more like "dahm" than the American "damn"). Once his trolls took off, he named his toy-making company Dam Things, and the highest quality of these trolls became known as Dam Dolls. One design even went by the name Dammit. 5. THE LARGE MAJORITY OF TROLLS ON THE MARKET WEREN'T DAM'S DOLLS, THOUGH. By the early 1960s, trolls were a huge international trend. Dam rapidly expanded his distribution network, opening factories in New Zealand and Florida. But because of their immediate success, and due to Dam’s lack of a copyright, knock-off trolls showed up on shelves all over America. Competing companies put out troll-esque dolls with names like Wish-niks, Fauni Trolls, and Lucky Shnooks. According to The New York Times, "the Dam Company earned only a small percentage of the estimated $4.5 billion made from Trolls throughout the world." 6. ONE DAMMIT DOLL HAD AN AUDIENCE WITH THE PRESIDENT. Amelia Earhart made headlines in 1932 for becoming the first woman to fly solo across the Atlantic Ocean, and it took 31 years before pilot Betty Miller became the first woman to earn that title for the Pacific. Her only company for the arduous flight? A Dammit doll. Following her historic flight, Miller was invited to the White House to meet President John F. Kennedy, and she brought her trusty troll doll with her. 7. TROLL DOLLS WERE THE ORIGINAL BEANIE BABIES. When the troll takeover of America hit, it hit hard. The Chicago Tribune reported in a 1964 trend piece that "bring your own troll" parties were "'in' among the teenage set," and many of those devotees grew up to be major collectors. A West Virginian woman named Paula Dolog—alias: "The Troll Princess"—told her local newspaper in 2009 that she’d collected so many troll dolls over the course of 45 years that she had "trolls that haven’t seen the light of day in years." Other devotees told stories of picking up trolls to cheer ailing family members, only to begin collecting them in earnest soon after. And when the '90s wave took hold, 29-year-old Lisa Kerner put together a pre-internet Craigslist of sorts called Troll Monthly Magazine, intended to help collectors sell and trade the dolls. Scouring resale sites today will still bring up all manner of troll dolls, from a 1950s stuffed Dam doll going for $225; to themed dolls, like this vintage Viking troll for $175; to a terrifying Lucky Shnooks doll from the '60s. 8. A SELF-PROCLAIMED TROLL QUEEN RUNS A TROLL MUSEUM. In Alliance, Ohio, a woman named Sigrid calls herself the Troll Queen. She claims to be a huldra troll—the kind of troll that disguises itself to appear human—and has used her passion for the creatures to amass a collection of nearly 3000 unique trolls, setting a Guinness World Record. Sigrid (human name: Sherry Groom) has turned her love of the dolls into a weird and wonderful museum called The Troll Hole, which now houses more than 18,000 trolls and memorabilia. She gives guided, costumed tours once a day; there’s only a $10 troll toll to visit the Troll Hole. 9. TROLL DOLLS HAVE DONE POLICE WORK. In a move called "Trolls on Patrol," the police department in Tarpon Springs, Florida bought 5000 troll dolls in 2003 and put them to work. The goal? To build relationships with area children. "It should bring some friendly interaction," police chief Mark G. LeCouris told the St. Petersburg Times at the time, noting that they wanted local kids to see police officers as approachable role models, and that their previous giveaways of items like junior police badges and "Say No to Drugs" bracelets had always been popular with kids. Police handed out the trolls at Halloween and at various community events. "They really put smiles on kids' faces," LeCouris said. 10. FOUR DECADES LATER, THE DAM COMPANY WON THEIR PATENT. Even though Thomas Dam lost his creation to the public domain in America in the '60s, his company soldiered on in Europe. The '80s saw another wave of troll fandom, most notably when a New York-based marketing executive named Eva Stark decided to import large numbers of Dam's trolls and rebrand them as Norfin dolls ("Norfin" being a portmanteau of "elfin," "orphan," "Norway," and "Finland"; no word on why "Danish" or "Denmark" wasn't thrown in for consideration). Thomas Dam died in 1989, but new laws passed in 1994 allowed the Dam Company to sue copycat manufacturers. Eventually, they won the worldwide rights to the troll doll image. 11. EVEN WITH A MAJOR SALE, THE DAM COMPANY KEPT THEIR HOLD ON SCANDINAVIA. After a misguided attempt to update the Troll brand (recreating them in the image of Bratz dolls in 2005 and calling them Trollz was a huge failure), the Dam Company agreed to sell worldwide rights—save Scandinavia, naturally—to DreamWorks Animation in 2013. "Trolls is one of those rare, proven and universally adored brands," DreamWorks’s franchise head, Shawn Dennis, said at the time of their intention to create a multi-platform marketing plan. Within the year they’d reworked the Trolls movie’s original concept, turning it into a musical comedy that would eventually bring on Justin Timberlake as the executive musical producer. That choice, at least, has already paid off—the debut song from the soundtrack, "Can't Stop the Feeling! ", topped the charts in more than 15 countries when it was released. 12. HASBRO HAS RELEASED A NEW LINE OF TROLL DOLLS. Not only do the trolls from the new DreamWorks movie have updated faces (the large heads and stubby bodies resemble the '60s originals, but the facial features are far less oversized—or wrinkly), they now also come with huggable plush bodies. And with so many of the Trolls movie characters getting both the plastic figurine and plush doll treatment, it seems only a matter of time before the collectors come out in full force again.